Bitcoin has had a very impressive month, characterized by a slew of broken all-time highs, but the latest sweeping correction, has confirmed the end of this bull-run. Everything seems to be increasingly building towards the steadily approaching segwit activation, which is expected to now happen on the August 23 (GMT 16:39). After reaching the new $4,480 all-time high on August 17, bitcoin began a downward trend that culminated with today’s $3,600 weekly low. 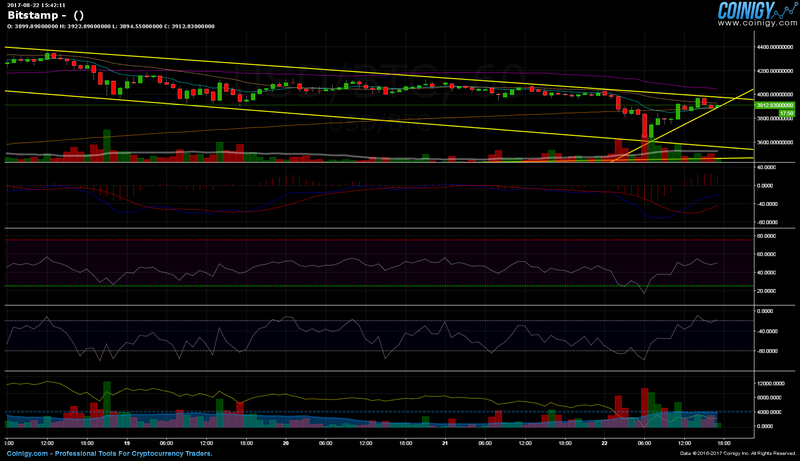 Volume was stagnant before the violent drop, but looks to be slightly expanding on the hourly charts. 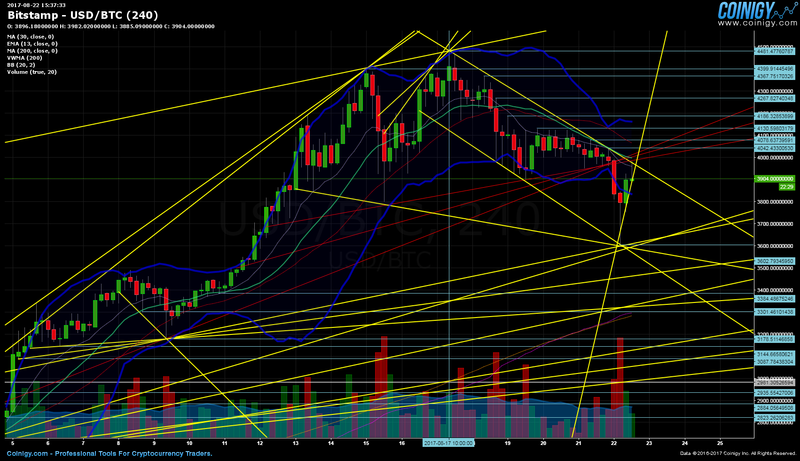 Even so, the price is still very far from the monthly low, which sits at $2,600. Bitcoin cash had a remarkable weekend, hitting almost 1,000 USDT on both poloniex and bittrex, the crypto currency saw a strong pullback to its present market price, 670 USDT. Select altcoin markets were also active during the weekend, notably dash, monero, as well as ethereum. Past bitcoin trend lines were shattered after the dip (marked in red), the same is true for older support levels. Our first and primary new support is at today’s $3,600 low, secondary supports are at $3,384.48, $3,301.46, and at $3,178.51. The last batch is before the $2,980 June high, which is the final foothold ahead of a complete bitcoin meltdown, the two prior tertiary supports are at $3,144.66, and $3,087.78 respectively. 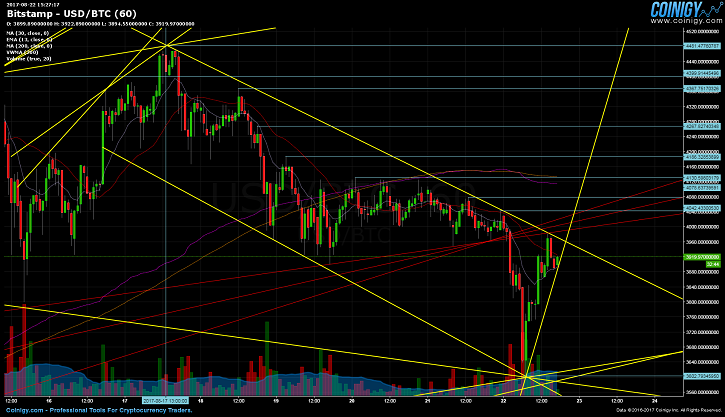 With ample resistance, there appears to be much more room for growth, in case we end up seeing another upsurge. All of the significant coordinates are from the former trading spectrum, rooted at $4,042.66, $4,078.63, $4,130.59, and at the $4,186.32 resistance level. The next cluster of price points is located higher, right before the $4,480 all-time high. These preceding resistance levels are at $4,267.82, $4,367.75, and $4,399.91. FIB’s for the ongoing trading range, do not completely overlap with horizontal levels, aside from the 0.5 fib ($4,039), which is a bit below, but still in close proximity to the $4,042.66 resistance. 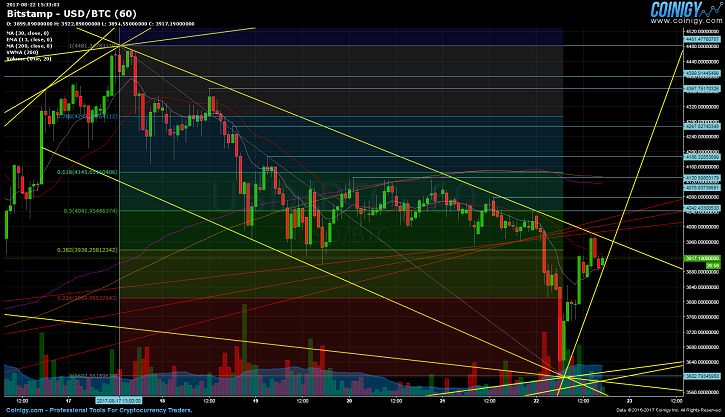 The 0.618 fib ($4,146) is adjacent to the $4,130.59 resistance. Furthermore, the 0.786 fib ($4,294.42) is neighboring the $4,267.82 resistance as well. Intersecting trend lines show the $3,600 weekly low, as a massive point of interest. 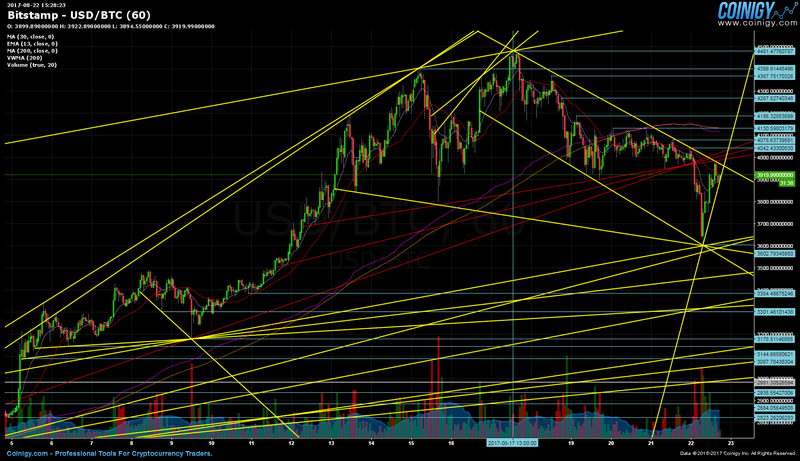 The same is also true for the $3,179 support, which is weighed down by 4 converging trend lines. Bollinger bands are showcasing different signals and tendencies across the board. The daily chart is primarily defined by price movement, within the wider gap that currently exists, right between the upper and lesser bands. 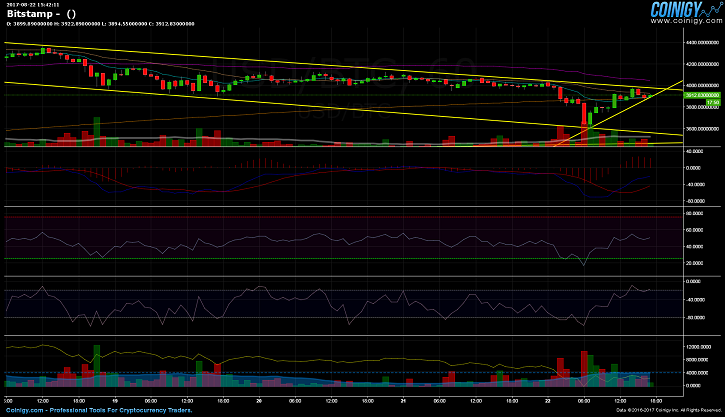 Even so, today’s price plunge did briefly result in the bitcoin price hugging the underside of the lower band. On the other hand, the 4-hour price line is accelerating towards the BB median line, while the hourly has already broken above. The gap has widened on both charts, volatility will be increasing in the short-term. The 200-day moving average has on the whole, been trending horizontally, although a minor descent has started to become noticeable. With the 30-day MA, a reversal could be under way, and ideally, we would need to witness a bullish crossover beforehand, or somewhat after the segwit activation. A bearish MA crossover had previously occurred on August 19 (GMT 19:00), which was a strikingly pronounced warning in hindsight. RSI is slowly creeping higher, and may soon reach overbought conditions, if the ongoing momentum and price movement persists. The Williams %R has contrary to the RSI, been vastly overextended during the same time. 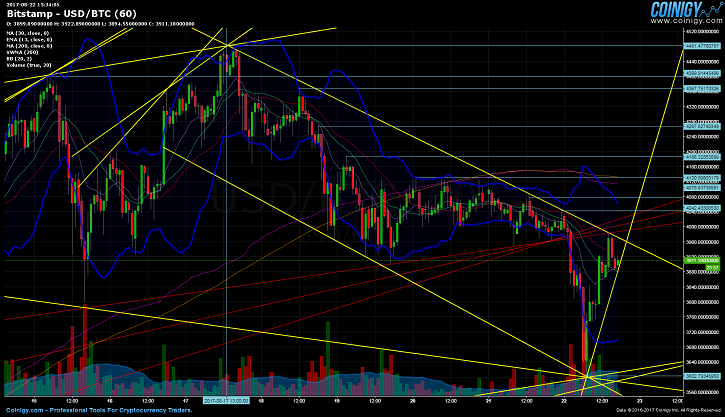 Furthermore, OBV is severely depressed, and hourly volume is wavering for now. The MACD has shot over the signal line (GMT 10:00), resulting in a bullish crossover (marked with a green vertical line). Bitcoin began trading on August 16 at $3,799, and after a strong run-up, the former $4,399.91 all-time high was quickly broken, with the presently uncontested and latest $4,480 all-time high, now holding as new benchmark for future price action. Upon touching the new high on August 17, the remainder of the week saw a slow decline, that finally culminated with a new $3,600 weekly low. Price is currently moving gradually towards the $4,040 daily high, and if buying volume picks up, we might see higher highs before the day’s end.